This second edition of the Handbook of Astronomical Image Processing (HAIP) and its integral AIP for Windows 2.0 image processing software (AIP4Win2.0) addresses many important changes that have taken place in astronomical imaging since the publication of the first edition. Today’s affordable astro-imaging capable digital single-lens-reflex cameras (DSLRs), the growing power of personal computers, and the proliferation of telescopes and imaging accessories has brought imaging capabilities within the reach of practically every amateur astronomer – and this second edition of the Handbook plus AIP4Win 2.0 is ready, willing, and able to assist every observer in making great astronomical images. Counting Photons: “Astronomy is about counting photons….” Covers signal, noise, the signal-to-noise ratio, the Poisson and Gaussian distributions and why they matter, making better pictures by summing images, and how dark frames and flat frames effect the signal and noise in your images. Digital Image Formats: Covers the file formats that astronomers use, including FITS, TIFF, BMP, and JPEG. Learn file format basics, how your image data is arranged inside the file on your computer’s hard disk. Imaging Techniques: “Good equipment is only half the story!” Covers the techniques that experienced imagers use to obtain high-quality images. Includes polar alignment, good guiding, critical focus, correct exposure, darks and flats, light boxes, and special considerations for DSLR cameras. 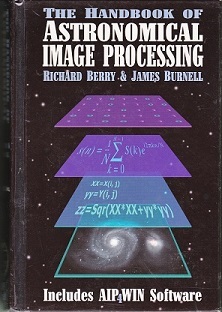 Image Analysis: “Locked within the numerical values that make up a calibrated CCD image is a staggering amount of information.” Covers pixel coordinates, pixel value, image statistics, the image histogram, feature analysis, the centroid, distances, and image profiles. Linear Operators: All about one of the most useful tools in the amateur astronomer’s digital toolbox. Describes how digital convolution performs crispening, sharpening, smoothing. Learn about low-pass and high-pass kernels, Sobel, Kirsch, and Prewitt operators, and that most useful of linear tools: the unsharp mask. Building Color Images: You’ve seen fantastic astro-images on the web and in popular magazines and books. Learn how astronomers capture and build color images from multiple exposures through different color filters. Covers the colors of astronomical objects, luminace, chrominance, color space, white balance, G2V stars, RGB and LRGB color image capture. NOTE The Handbook complements and extends what you learn, and is NOT a software manual for AIP4WIN2.0. AIP4WIN’s manual is a massive on-line help file always ready to give you answers at a moments notice, a context-sensitive on-line guide to the software. The Handbook and AIP4Win 2.0 are sold together as a complete package. Under no conditions do we allow the software to be split from the book or the book to be separated from the software. Image Enhancement: Discover how to extract detail from otherwise bland images. More than producing “pretty pictures,” using the techniques will demonstrate to your enhanced details and show structures that, due to their low contrast, might otherwise be invisible. Processing Multiple Images: Here is power at your fingertips! Calibrate an entire imaging session’s worth of images at one time automatically. Align and enhance a set of images in preparation for creating a movie. Align and combine a group of images to create a single, “deeper” image. Process hundreds of planetary images. Building Color Images: Learn how the “Join Color Tool” helps you to create stunning color images hassle-free from sets of red/green/blue filtered images. AIP4Win 2.0 retains its highly acclaimed interface but with significantly increased capabilities. Now, AIP4Win 2.0 processes all image data in 32-bit floating-point format to insure that you will not lose even one photon of precious light. Atop these powerful 32-bit floating-point core routines, we built an image display engine capable of showing you images in both color and black-and-white, from a minimum of 10% to a maximum of 1600% size. What you can load into AIP4Win2.0 and display is now limited only by the memory on board your personal computer – and this capability is not limited to black-and-white images – AIP4Win 2.0 now has a suite of sophisticated software tools for loading and processing astronomical color images plus new functions that predict the results you’ll get when you make camera images and combine them in software. Image file size is limited only by your computer’s available memory. and at this point you normally see “Plus much, much , more . . .” but there is! Click here for 5 pages of much, much, more.